Thanks so much for your post, I’m an experienced scuba diver but I am about to take my 13 year old T1D son on his first discovery dives and I was having trouble finding much information on CGM issues. This was very useful! Hi Dana thanks for your post. 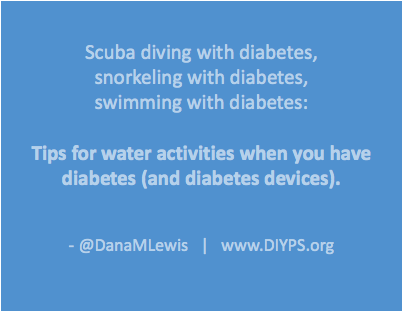 I have been snorkeling for many years with a pump and have managed my BG much as you do. It is so much easier now with CGM which keeps me more regular in general. I also have to say that at 59 and a Type I diabetic for 35 years I have continued the activities I loved inc. hiking skiing sailing and snorkeling and feel that the odd BG high incurred is worth it for the quality of my life!